This review is for the Salmon, Salmon Meal, & Deboned Turkey recipe, but consider the other recipes for indoor, kitten, and senior as on par. The top three ingredients are a combination of salmon and whitefish which is really good to see, and in stark contrast to most supermarket foods that make you believe they’re meat-based but are really more wheat and other fillers. Wellness have it right, so we’re off to a flying start. The grains used are rice (which will be the inferior white rice), combined with barley as a decent grain, and ground rice as a further inclusion of rice. I estimate the carbs to be 29% which is a fair bit higher than Wellness CORE. Cats are obligate carnivores so have no need for grains, but these ingredients are often included as a way to keep production costs low. The grains in this food are far better than the wheat, sorghum, or corn we find in many cheaper cat foods. 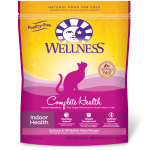 I note with Wellness CORE formulas the inclusion of oils such as salmon oil. That doesn’t seem to be present here, but we do find flaxseed as a great ingredient for heart health, healthy skin, and glossy coat. It’s nice to see the inclusion of chicory root as a natural prebiotic to promote friendly bacteria in the large intestine, and also as a dietary fibre helps overweight cats to feel full. As with all Wellness foods we find a range of fruits, vitamins, and minerals of a high standard. This is certainly a premium food (with a premium price tag). I’ve rated it 4 stars as Wellness CORE is definitely better as an alternative. Salmon, Salmon Meal, Whitefish Meal, Rice, Ground Barley, Ground Rice, Chicken Fat (preserved with Mixed Tocopherols), Deboned Turkey, Natural Fish Flavor, Tomato Pomace, Cranberries, Chicory Root Extract, Ground Flaxseed, Potassium Chloride, Cranberry Extract Powder, Cranberry Fiber, Vitamins [Vitamin E Supplement, Niacin, Beta-Carotene, Vitamin A Supplement, Thiamine Mononitrate, Pyridoxine Hydrochloride, d-Calcium Pantothenate, Riboflavin, Vitamin D3 Supplement, Vitamin B12 Supplement, Folic Acid, Ascorbic Acid (Vitamin C), Biotin, Menadione Sodium Bisulfite Complex (Vitamin K)], Minerals [Zinc Proteinate, Zinc Sulfate, Iron Proteinate, Ferrous Sulfate, Copper Sulfate, Copper Proteinate, Manganese Proteinate, Manganese Sulfate, Sodium Selenite, Calcium Iodate], Choline Chloride, Mixed Tocopherols added to preserve freshness, Taurine, Glucosamine Hydrochloride, Chondroitin Sulfate, L-Carnitine, Dried Kelp, Yucca Schidigera Extract, Dried Lactobacillus plantarum Fermentation Product, Dried Enterococcus faecium Fermentation Product, Dried Lactobacillus casei Fermentation Product, Dried Lactobacillus acidophilus Fermentation Product, Rosemary Extract, Green Tea Extract.